Hiss Golden Messenger On World Cafe : World Cafe The latest record from M.C. Taylor's band is a stylistically eclectic road album about the need to get back home. Hear the conversation and performance. 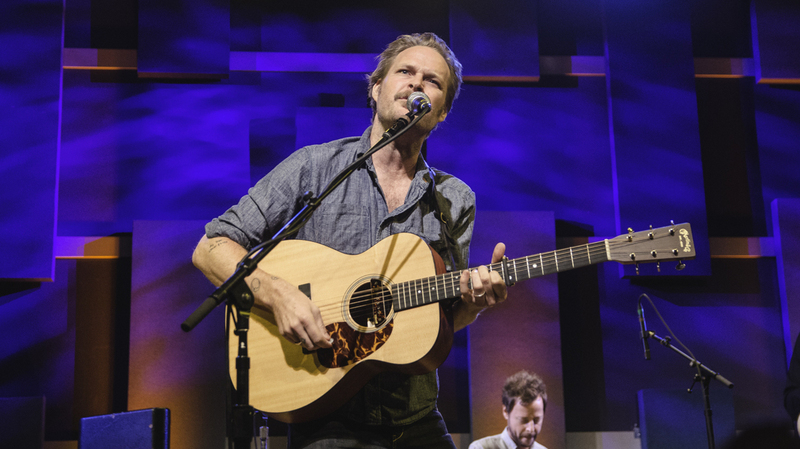 Hiss Golden Messenger performs live in Philadelphia for a WXPN "Free At Noon" concert. "Say It Like You Mean It"
Heart Like A Levee, the new album from Hiss Golden Messenger, soulfully weaves together all the musical styles we have come to expect from the North Carolina band. Led by M.C. Taylor, the band marries airy country, Van Morrison-style soul and dusty rock 'n' roll with lyrics that feel both universal and surprisingly personal. It's a road album about needing to get back home — a conflict between music and family that every band in a van feels, but that few can express like Taylor. In this session, hear Hiss Golden Messenger's performance from the stage at World Cafe Live, along with a conversation that enhances the album's story. This is perfect music for fall, and Taylor and his bandmates — Phil and Brad Cook, with drummer Darren Jessee — sound wonderful.